Not being able to find your way in a car in the depths of Agua Blanca, is always an interesting experience, just as it was this evening! The problem with the place, if you don’t live there, is not knowing where one barrio ends and the next begins: and such things as posts with street names/numbers on, are non-existent. The only way to tel where you are is to look for the tiny little ‘plaques’ on some house which tells you it’s number, and that relates to which street forms a junction with which road…. here, calles (streets) go like north to south, and carreras (roads) go east to west. Then somewhere, every now and again thrown in, is the occasional ‘avenida’ (hopefully self-translatable! So, my lovely mate Wilmar is driving us into one of the most dangerous barrios this evening – ‘us’ being him, me, and Sandra, who was translating, and is Dutch, so, to Colombians, therefore, also a gringo: two gringoes in one car could well be like all your Christmases coming at once, if you happen to ask the wrong person for directions! Wilmar is amazing, how he knows his way around, even barrios he’d rarely go to if it wasn’t for lunatics like me who love to preach there, and love to see God move there. The blessing it is, too, to pastors in such districts, that a foreigner would a) go there, and b) WANT to go there, is worth the sweat-bringing, bowel-moving experience of going there. Tonight was no exception. We found the church after a few ‘stop and ask the way’ moments: and were directed by the pastor to park up on the grass with the car doors as near to the church door as possible…. 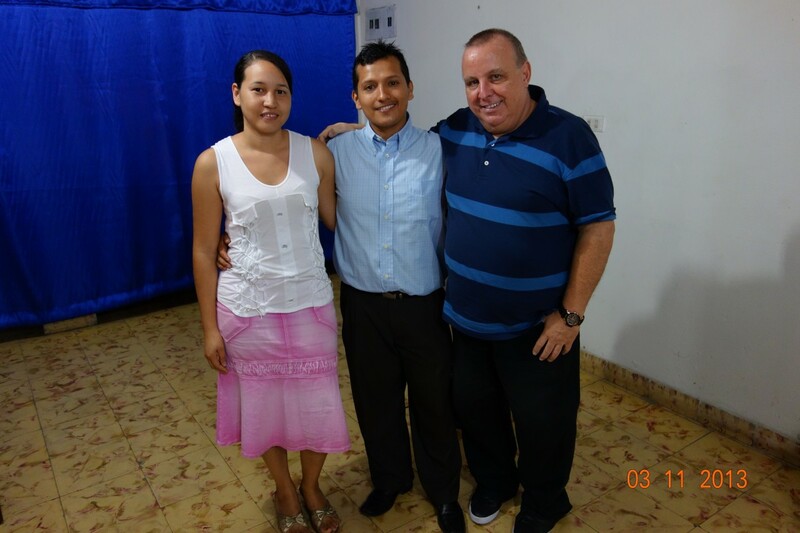 Mauricio & Sandra Naspiran are the pastors of ‘Iglesia visión y avivamiento’ – Church of Vision & Revival. He’s young, but is doing a wonderful job there. 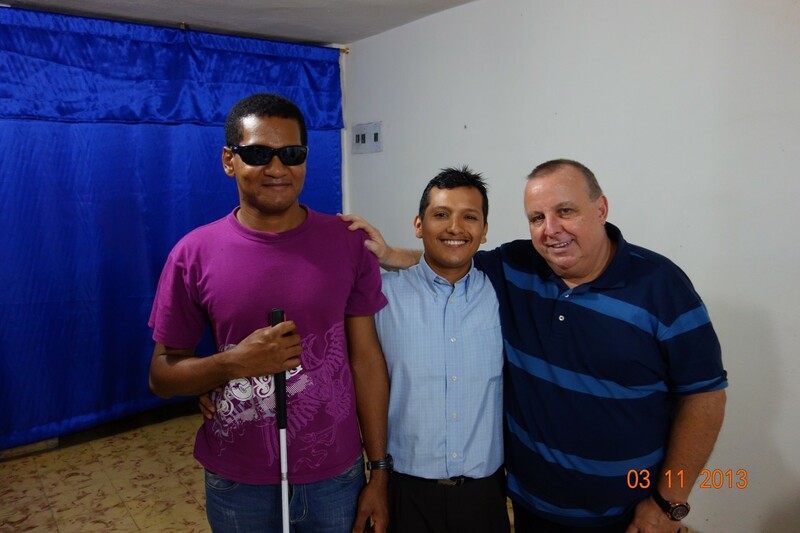 He was at the church in Los Lagos earlier in the week (Wednesday 30th blog), and wanted prayer for healing then, but there were so many people waiting he gave up…. then Wilmar contacted him and asked him if we could to his church. I think he was overjoyed! At first, it seemed it might only be two or three people there – no problem to me, it’s just a blessing and an honour to be asked to preach in someone else’s church. I guess the final number was somewhere between 15 and 20. And God delighted to presence himself there…. Sandra was great translating: it’s a remarkable gift, translating, as it’s not just the ability to speak English – or whatever language – it’s the speed of thought to contextualise, remove colloquialisms, and translate, in a split second. And Sandra, who’s Dutch as I mentioned, was translating from second to third languages. Many wanted prayer. Some, nothing (noticeable or instant) happened for: including a lovely guy, Jhon, who was pretty much blind in his right eye (saw light) with glaucoma, and had no left eye at all. So longed to see God give sight and create a new eye: I feel it will happen, but sometimes God just seems to want to remind me that he’s the healer, and that the glory is his, and he won’t necessarily share it with me to my order! Mauricio’s prayer for healing, as worship leader as well as pastor, related to being hit by a motorbike some months back: little seemed to happen at the time, but very soon, he was in great pain with his carpal tunnels, and the balls of his hands, one extremely swollen, to the point where it was excruciating to play the guitar. He was healed instantly, and burst into tears…. when he’d tried to play earlier on, a string broke, so I just wanted to add to his blessing by giving him the money for a new set of strings! Brian & Robert had an equally great evening in Ciudad Cordoba: I’m pretty certain that by the time I post this, Brian & Robert’s posts will be on my page! « Just an ‘ordinary’ practical blog….